It is shocking news for me and probably to many that according to security specialists at National Vulnerability Database, at present moment for year 2014 Windows looks like more secure than both Apple's (iOS and Mac OS X) as well as to Linux. Windows has been bullied for its bad OS design and easier to breach Security compared to Linux, there was a constant hype also of Mac OS users claiming the invulnerability of their BSD based OS, but it seems security breach statistics given by National Vulnerability Database security breach evaluation reports tell us security issues for 2014 Windows OSes while compared to other OS vulnerabilities in different operating systems such as Linux. I will have to disappoint Apple Mac fans but in 2014 Mac OS X was found to be riddled with the greatest number of security problems — 147 in total, including 64 rated as high severity, and 67 as medium. 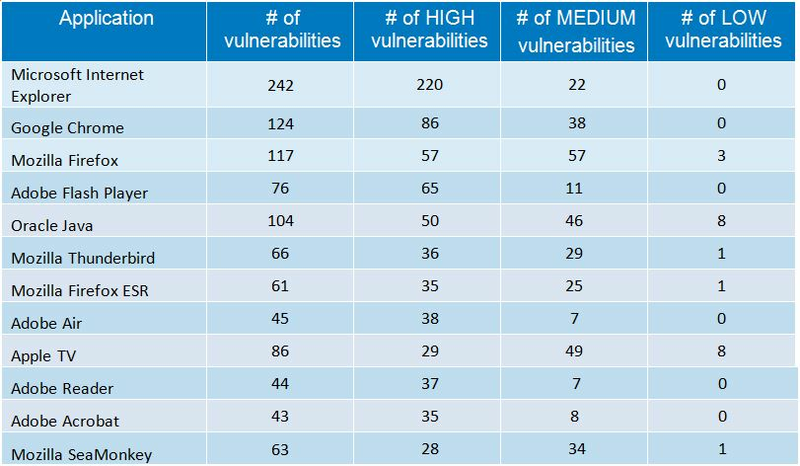 iOS's security was also ranked poor with 127 vulnerabilities including 32 high and 72 with a medium rating. For comparison the latest Windows 8.1 had only 36 vulnerabilities, and its predecessors — Windows 8 and 7 — both had same number. In Enterprise World (users) Windows Server 2007 and 2008 both have 38 vulnerabilities. 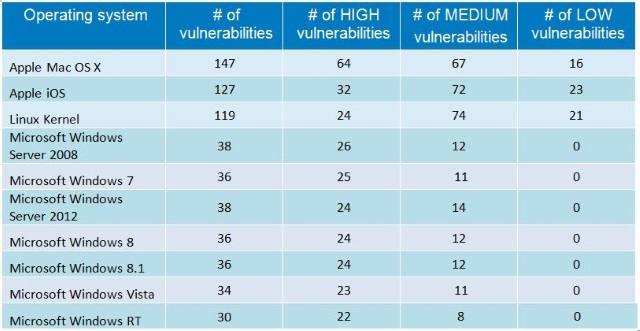 Reported vulnerabilities were mainly of middle and high severity. Overall statistics also show there has been a huge increase in the number security vulnerabilities in the NVD security reports database. In 2013 the number of all logged vulnerabilities were 4,794 while this jumped to 7,038 in y. 2014. The good news is lower percentage of all logged in security issues were rated of critical security importance. It is mostly third party software not part of OS which contain security issues, 83% of all reported vulnerabilities were laying in 3rd party applications, only 13% percantage were OS specific and 4% hardware related. Though overall statistics shows Microsoft products more secure than Apple Inc. Products and (Open Source) Linux, though still M$ Internet Explorer is the most insecure web browser, for 2014, Internet Explorer had 242 vulnerabilities while Google Chrome had 124 security issues and the most secure browser rated for 2014 is (surprising for me) Mozilla Firefox. This entry was posted on Tuesday, February 24th, 2015 at 3:25 pm	and is filed under Computer Security, Curious Facts, Everyday Life, Various, Windows. You can follow any responses to this entry through the RSS 2.0 feed. You can leave a response, or trackback from your own site. One important note to make is the statistics for Mac OS X are not listed divided by versions but are shown as summed for all Mac OS X version this is a bit manipulative info, as for Windows it is listed shown divided by Windows OS version.